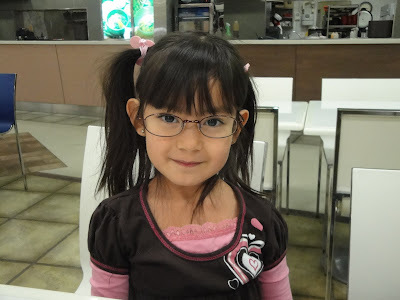 Does your Kids love to try wearing your eye glasses on? My kids love to wear my eye glasses on, they thought that having an eyeglasses is cool, that they don't know is that it's actually an inconvenient for me hahaha. If I can just correct my eyesight without having to use an eyeglass I would because using an eye glasses for me is a pain especially if you are in a hurry. It also gives me a migraine every time I uses it all the time. But anyhow, if you are looking for some fun eyewear for your kids or some prescription eye wear for your love one that is on price that won't put holes on your wallet, Zenni is the right place to get it. I find some neat designs for kids and adults alike. So there, my kids wearing my eye glasses, I hope that they won't wear a eye glasses just yet. Thats what I thought too bading when I was little. They look matured with eye glasses si EJ parang docotr or teacher with eyeglasses on. Ang ganda naman nang mga kuha ni EJ at Rylie na nakasalamin. Para silang genius, lol. Mas angkop kay EJ yung salamin dahil nag blend sa pesonality niya. Si Rylie ay parang nag mature at parang pakiwari mo ay titser sa kanyang salamin, lol. Thanks for the post. God bless you all always. they look so cute... but seriously, i am hoping they wont wear eyeglasses yet too. Naku Rose!totoo nga..ang hirap ang laging nakasalamin parati. pero kyut sa kanila ng mga anak mo,hehehe! my maia loves taking away my eyeglasses from me once she sees me wearing them. then she will attempt to try them on herself. she already "destroyed" a pair. good thing i still have one extra. ganda ng mga chikiting mo, kabayan! more power to you & yours. be well!